5:38 PM, August 30, 2010. Taken with my phone because I didn't have the camera with me. Does he look dead or what? Not sure whether it was the warm weather or Dusty's old age or laziness or all of the above. He didn't bother to move at all as I snapped pictures of him all stretched out. I took several pictures at different distances and finally I was almost in his face when I took this picture. Maybe he was sleeping. 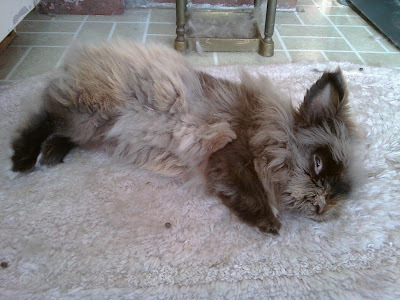 Bunnies often sleep with their eyes open. He was definitely in his most relaxed state. If I didn't see his chest moving slightly up and down from breathing, I'd think he was dead. He's just now shedding off his winter coat, so the light fluffy hair is everywhere. Short darker new hair is underneath all that fluffy hair. I just came back from a mushroom hunt a couple days ago. 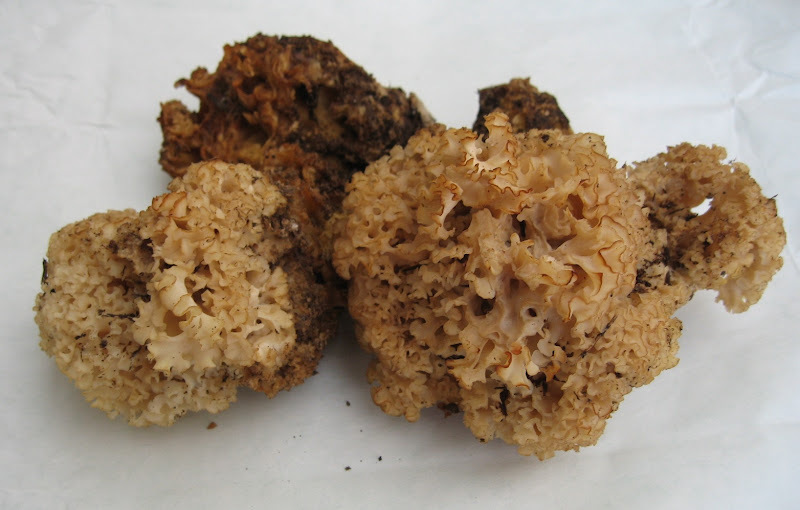 Today there are several alarming headlines on mushroom hunting. 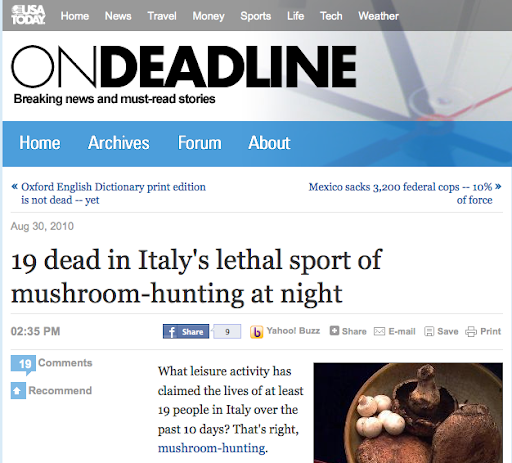 On USA Today, the headline is "19 dead in Italy's lethal sport of mushroom-hunting at night". Reuters headlined its story: Mushroom hunter "massacre" claims 18 lives in Italy. Since these deaths happened in Italy, I suspect they were hunting for porcini, the very same mushroom I was hoping to find. However, I have enough common sense not to be wondering around in the woods at night. If I didn't fall off the cliff, I could be attacked by a mountain lion. No amount of porcini is worth killing myself by tumbling over rocks or torn apart by wild animals. Can you carry something the size of your head with your teeth and try to flee? I was trying to get a few things done on the farm before running out of daylight. Suddenly I heard some leaves rustling and the sound of an apple hitting the ground. I looked up and saw the thief in the picture sitting right in the middle of the apple tree. He sensed that I was looking at him and started running along the fence and hopped out. I thought he was gone then he re-appeared and started running the other direction. He stopped and looked at me several times. I tried to get closer only to take some pictures. I don't want that apple back anyway! While hanging out with fellow mushroomers at MSSF Summer Picnic, Chef Pauly and I decided to go hunt for porcini today. Initially, we wanted to go to San Francisco, but 1. I don't like the idea of parking in San Francisco, 2. I wanted to go somewhere more peaceful than the crowded city. This morning we headed out for Salt Point State Park. It's about 2 hours of driving from the east bay. I thought it would be a nice day trip regardless whether we found porcini. Besides, I have been hearing about Salt Point for the last 5 years and figured it was time to check it out. We took a hike in the woods poking around the pine needles and dried leaves. We found some wild mushrooms but none were good to eat. There was no sight of porcini anywhere. As we were heading back to the parking lot, I suddenly noticed a head of cauliflower mushroom at the foot of a big tree. During my very first mushroom foray in January, 2006, lead by legendary David Aurora, someone found a large beautiful head of cauliflower mushroom. I have never forgot the sight of it. When I spotted that whitish blob in the dirt under the tree, I knew it was cauliflower. I carefully wiped away most of the dirt on it and dug it out. I also remember it being quite tasty. I'll have to show it to Master Ken tomorrow on the first day of Mushroom Cultivation class. Last night I cleared up all the potted plants under the trellis and cut back other plants growing around it. It is now free and clear to go. 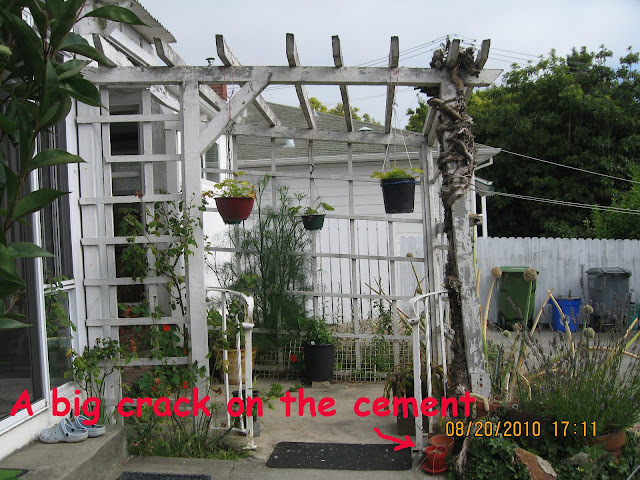 I wanted to rebuild this beat up trellis for many years, but I realized that I couldn't do it myself. There are simply too many memories around it. There were plenty of smiley family portraits taken around it when it used to be covered with purple Bougainvillea flowers. After Neal arrived this morning, I went to work in the front garden because I didn't have the heart to watch it coming down. Silly, isn't it? You can imagine that there are all sorts of knickknacks all over the farm because I can't throw them away. Neal noticed the microwave oven sitting in the sun room. He told me that's the oldest microwave he's ever seen! It is over 30 years old but still works well. I continue using the ancient microwave even though there are 3 modern microwaves stacked up in the garage. I am going to be really sad the day it stops working. Later during the day, Joseph came by to dig up the rest of the juniper bush. Just like the trellis, the juniper had been on the property since my family moved in almost 30 years ago. It was difficult to chop it off both physically and mentally for me. I had many flash backs of carefree childhood days while I was cutting it away. Now that it is all cleared up, I plan on planting another fruit tree in there. I love eggplants, and I am a little obsessed with eggplant dishes. It can be cooked in any form and ethnicity, and it's all excellent! Whenever I am in a restaurant and can't decide what to get, I'll just pick the eggplant dish - eggplant parmesan, Baghara Baigan (Indian), Pud Makua Yow (Thai), eggplant tempura, eggplant in garlic sauce (Chinese), eggplant hummus, etc. Every year I try to grow eggplant. Sometimes I try to grow from seeds, other times I get 4-inch plants from local nurseries. So far I have very little success with them. Sometimes they die off completely. Sometimes, I get one or two tiny eggplants. I never got enough to actually make a dish with them. I planted 8 4-inch eggplants back in mid-April. Pill bugs love eating their leaves. For a while I thought none of them survived. I was surprised to see them bloom over a month ago. I was happy just to see the purple flowers. A couple days ago, I was delighted to see these little eggplants growing under those tattered leaves. I have been picking apples and giving them away for the past week. Instead of giving them all away, I thought it would be a good idea to put my dehydrator into use. I picked up this 8-tier American Harvest dehydrator earlier this year after I raided the chantrelle gold mine. I considered getting one of those hand cranking apple peeler/corer, but then I remembered that I have a mandoline slicer. I normally eat apples without peeling them anyway; besides, these are organic apples from my farm. I ended up just getting an apple corer. To prevent the sliced apples turning brown from oxidization, I first prepared a bowl of lemon juice mixed with water and some salt. I sliced the cored apples directly into the lemon salty water and let them soak. As you can see from the picture, they didn't turn brown at all. You can see that they are not all in perfect rings. That's because I cut off all the blemishes. After the bowl was filled with apple slices, I took them out and lined them up in the trays of dehydrator. It's best for them not to overlap. I set the dehydrator at 140 degrees. I made my slices pretty thin, so they will most likely be ready in a few hours before I turn in for the night. Oh, I also put a very fragrant rose in the dehydrator. I can actually smell the apples as they are drying. Update: They weren't actually quite done last night. I lowered the temperature to 95 degrees, the lowest setting on the dehydrator, before I went to sleep. This morning, I stuffed them in 2 ziplock bags. Finished! Perfect snack for later. Minutes after I left the farm this morning, I knew that I had to go back. The sun was out. It was barely 9 AM and already 69 degrees. Surely when I got to the office, I saw a heat wave alert on sfgate.com. The temperature was going to reach 90 degrees, which meant it would be about 100 degrees in the sun room, where Dusty stays most of the time. It is also where I keep my seedlings. I drove back to the farm around noon, and it felt like a sauna in the sun room. Dusty was hiding inside of his Fuji Apple box. I took him outside to his cage, fill the water bottle, and brought him a piece of apple and wood block. I also moved the 2 trays of plants out of there. 3 years ago, my tomato seedlings burnt to a crisp during one of these heat waves. I can't let that happen to my passion fruit vines that took me more than 6 months to root. I got home after 7 PM, and it was still over 80 degrees in the sun room. I watered all the vegetable beds and the Japanese maple trees in the front. Tomorrow morning, I'll be sure to put Dusty outside in his shady cage. I have been a member of MSSF (Mycological Society of San Francisco) for at least 5 years now, and this year I decided to attend the annual picnic for the first time at Joaquin Miller Park in Oakland. I got up just in time to bake a couple Apple Upside Down Cake for the picnic. Mushroom people love food and homemade organic dishes. This beautiful honey comb came from someone's backyard beehive. I look forward to keep some bees in the future. Honey comb from an urban beekeeper. Wow! I chatted with Don, who made the pasta with morel mushrooms. He showed me a bunch of pictures of the giant morels he gathered this year. He's been a mushroom hunter for 25 years! Mushrooms talk to him and guide him to their locations. He said it took 10 years for him to acquire that 6th sense. I guess I have 5 more years to go. Can't wait! Carol brought her signature deviled eggs with morels on top! Judging by the feast today, I can't imagine what MSSF monthly culinary group dinner is like. I shall attend my first culinary group dinner this upcoming season as well. Deviled Eggs with Morel Mushrooms! There comes a time when one must seek for help, and that time has come for me. For the last 6 months, I have been nursing some passion fruit cuttings. It took months for them to root, and now I have 3 glossy green passion fruit plants in green house #2. Before I plant them outside, I need to rebuild the beat up trellis. Instead of rebuilding it with wood, I would like to use bamboo. I want a more Asian appeal and environmental friendly material. The trickiest part of the project is the big crack on the cement base. You can't really see the crack from the pictures but the crack causes the structure to be slanted which you can see in the next 2 pictures. My friend Joseph, who just started his own gardening business, came by today to check out the trellis. The project is a little bigger than he anticipated. He said this structure is an arbor not a trellis. Okay. I really wasn't sure what the appropriate name is. Joseph will take on another project instead of Bamboo Trellis project. On Sunday, Neal, who I met at Permaculture Solstice Convergence, is coming to take a look. I expect more inquiries from Merritt College students once the classes start again next week. I bought a bunch of young asparagus a few days ago. When I was breaking off the tough parts of the asparagus, I thought I would save those parts to make asparagus tea. Within seconds that idea turned into asparagus gelato. What would complement asparagus? No, I am not putting Parmesan cheese in gelato. Think. Think about what I have on the farm. Ah! Lemon! That's it, asparagus lemon gelato. You might think it's weird to use asparagus for a dessert. I just Googled for asparagus lemon gelato and no hits. Maybe it's original. Asparagus iced tea is quite popular in Taiwan, and you can get it in Asian markets in cans or juice boxes. It is usually sweetened. If it's good as a sweet cold drink, I know it can work as gelato. I boiled the parts of asparagus in just enough water to cover them and left the asparagus flavored water in the fridge overnight. After I made the custard with whole milk, I left it to cool completely before putting it in the fridge for an hour. The ice cream maker works better when all the ingredients are cold. The "quick freeze cyclinder bowl" didn't seem to be cold enough when I made my rose gelato. After doing some research via Google, I left it in the freezer for a week. I also made the eggless custard a lot thicker than last time. As soon as the paddle started churning, I could see a big difference. I poured in the lemon zest and juice while the milk custard mix is churning. It got so cold that the peddle couldn't turn anymore after 15 minutes. The texture is very creamy. This is much more like what I was aiming for. Next time, I'll use Farm Village asparagus instead. Yes, there are asparagus growing in one of the raised beds, but I tend not to notice them until they start flowering. Yesterday was the last day of Master Ken's summer herb class. For the past 8 weeks, I have tried to learn as much about herbs as I could. I also have 2 barrels of mix herbs to show the little knowledge I have gained. I have slowly but surely started to integrate herbs into my cooking. When I pick green beans, I also pick basil to sauté with the beans. I have also made hot tea using fresh marjoram, peppermint, lavender, ginger, and stevia. I now have 3 different kinds of mint - Pennyroyal, Chocolate Mint, and Peppermint. I am most familiar with the scent of Peppermint. Chocolate Mint doesn't smell or taste like chocolate. Pennyroyal has many medicinal uses and its essential oil is highly toxic. Growing Japanese cucumbers has been a challenge this year. I have started planting them as 4-inch seedlings since March. Each time they were devoured by pill bugs. In late June, I bought another Japanese cucumber seedling with a couple melon seedlings, and they were attacked by a bird that was trapped in the garage overnight. I had to spend weeks to nurse them in the green house before planting them outside. This time, it has been able to flourish despite of limited sunlight and heat. Miraculously the wine barrel with the cucumber and melons is pill bug free. I grow Japanese cucumbers for pickling. The pickles are great for hot summer days although we are not having too many hot days this summer. I have been looking for a gelato or ice cream maker for that last 2 months. With all the fresh herbs and fruits on the farm, I have all sorts of ideas for gelato flavors. People ask me what is gelato and what's the different between gelato and ice cream. I first had gelato during my trip to Italy about 6 years ago. It was in November, but that didn't stop me from trying as much gelato as I could. A couple years after returning to the Bay Area, I started to see gelato shops popping up all over the place. Gelato is also known as Italian ice cream, Italian ice, or Italian ice milk. It is much creamier and denser than American ice cream. However, it's lower in fat because it's made with milk and sometimes water instead of cream. It's creamier because it's churned differently from American ice cream. There is little or no air gets mixed in gelato. American ice cream is fluffier because lots of air is packed into it. I prefer refreshing fruity gelato flavors over rich decadent flavors. There are two gelato shops in downtown Berkeley a couple blocks away from each other on Shattuck Avenue - Gelato Naia and Almare Gelato Italiano (formerly Gelato Milano). Both are quite good, but I like Almare Gelato better than Naia. To me, Almare is just a little creamier, and that's what I like. Another of my favorite is La Copa Loca Gelato in San Francisco Mission District. I was about to go all out and get an air tight, self-refrigerating gelato machine, but I couldn't locate one at the clearance price. There is no way I can pay full retail price. I have been making stops at various thrift shops and scanning through Craigslist every day for a good deal. Finally I found a basic Krups ice cream maker at a Good Will last weekend. I made my first batch of gelato, rose gelato, with fresh rose pedals. It smells prettier than it looks. Similar to most fruit, Mandarin Oranges like the sun. On top of the tree is where it gets most exposure to the sun; hence, picking the oranges requires a ladder. If your source of cute little Mandarin Oranges is Trader Joe's (Cuties!) or other stores, you probably don't know that picking these cute little oranges can be quite dangerous. The tree is full of sharp spikes that can easily draw blood or poke your eye out. I always make sure I have a jacket or thick long sleeve shirt on before attempting to pick the oranges. After standing on the wobbly ladder as I tried to reach as far as I could to pick the oranges, I got 7 cuties. Just like the tomatoes, these oranges are taking months to ripen due to lack heat and sun. I left the farm today to spend some time with MSSF (Mycological Society of San Francisco) at Summer Gardening Fair next to San Francisco Botanical Garden. I have been a member of MSSF for the last 5 years. It all started with a visit to its annual Fungus Fair 5 years ago. Over the years, I have volunteered in a few events to talk to the public about the society and mushrooms. Unlike the fungus fair, which is held in December during mushroom season, we didn't have a display of fresh wild mushrooms today. We used several colorful posters and some dried mushrooms. What made up for lack mushrooms was Lisa's Kombucha tea tasting. I tried Kombucha tea for the very first time earlier this year from Lisa's brew. I thought it was good, so I bought a bottle of commercial Kombucha tea from a store, and it was horrible! I learned that not all Kombucha tea is created equally. I have tried a few other people's home brew, but Lisa's Kombucha remains number one on my list. It's not likely I'll be making my own Kombucha tea anytime soon but I will definitely buy from Lisa when she launches her Kombucha line. Look at the flavors she has - Gingery Aid, Strawberry Bliss, Key Lime Pie, and Orange Julius. She had a few other developmental flavors for us to try, and they were amazingly good. Lisa gave us a few bottles (full soda size bottles!) of sample when the fair ended at 3 PM. I got one Ginger Aid and one Orange Julius. Instead of drinking coffee, I am going to be sipping on Lisa's Kombucha tea all day tomorrow in Master Ken's class. Can't wait! Master Ken (center w/beard) gives Lisa some feedback on Kombucha flavors while Lisa's husband, Joe, explains to people about Kombucha.